BooksBishop, Matthew and Michael Green (2008), Philanthrocapitalism: How the Rich Can Save the World, New York, NY: Bloomsbury Press. 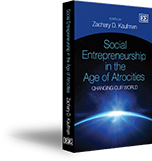 BooksBjerke, Björn, and Mathias Karlsson (2013), Social Entrepreneurship: To Act as if and Make a Difference, Northampton, MA: Edward Elgar. BooksBloom, Paul and Edward Skloot (2010), Scaling Social Impact: New Thinking, New York, NY: Palgrave Macmillan. BooksBlossom, Eve (2011), Material Change: Design Thinking and the Social Entrepreneurship Movement, New York, NY: Metropolis Books. BooksBornstein, David (2004), How to Change the World: Social Entrepreneurs and the Power of New Ideas, New York, NY: Oxford University Press. BooksBornstein, David (2005), The Price of a Dream: The Story of the Grameen Bank and the Idea that is Helping the Poor to Change Their Lives, New York, NY: Oxford University Press.